Somewhere between Icon of Coil and Combichrist, Andy Laplegua finds time for another project, Panzer AG. 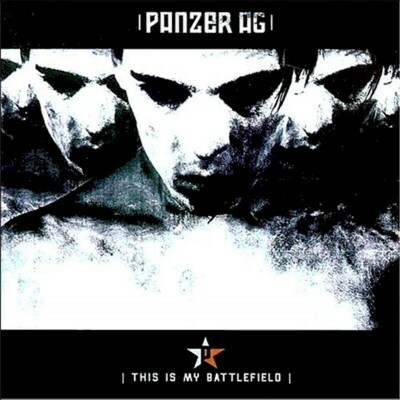 This first release under the Panzer AG moniker is titled This is my Battlefield and fits comfortably among the sounds of his other two projects. Take the synth stylings of Icon of Coil and pair it up with some of the crunchiest, dance-floor friendly noise and you have something accessible for a broad range of music fans. Fifteen tracks is the perfect amount of rich stabbing percussion, symphonic violin and distorted vocals. A fair balance is discerned between the beautiful melodies and destructive loathing created in emotive lyrics about conflicts of the world. “Introduction of the Damned” is the first track and indicates there are good things to follow with its symphonic melody and pounding beats. Other tracks that stand out include “Battlefield,” with its intense vocals and fun samples; “Panzer,” with its slower tempo and repetitive sampling; and “Behind a Gasmask,” with its nice use of guitars. It was surprising to find a local connection to Panzer AG on the track “Tides that Kill (Panzer AG vs. Symbiont)”. I’m not sure if it’s actually considered a remix, cover or what. If you remember, on Symbiont’s Broken Silence, Ted Phelps of Imperative Reaction did the vocals on this tenebrous piece. Panzer AG, Combichrist and all other projects with the name Andy Laplegua on them will definitely be a part of my CD collection. Oh—and you will be happy to know that you can pick this up for a domestic price on Oct. 12 on Metropolis Records.